There is interesting board game, known in Poland as “kręgle szachowe”. It’s a great game, but I have no idea about its name in English. I also don’t know any traditional name of this game. Words “kręgle szachowe” can be translated to English as “chess bowling” or “chess bowling pins”. But this game has nothing to do with chess or bowling. Let’s just say “chess bowling” is nice name. This is a little embarrassing for me, but I admi I can’t say too much about the origins of this game, nor about its names in other languages. I encountered chess bowling literally three times in my life. Once I saw a set of stones and the board, but I’m not sure if it was bought by someone or made by hand. Lech Pijanowski (Polish expert on games) descirbed this game as “folk game” known in Germany and Scandinavia. I looked for for information about it in English, German, Russian and even the Swedish sources. Unfortunately I still don’t know anything more. Maybe I had a bad luck, or it’s really hard to find something. If you have some knowledge about this game, please write in the comments. Now I’ll describe the rules. 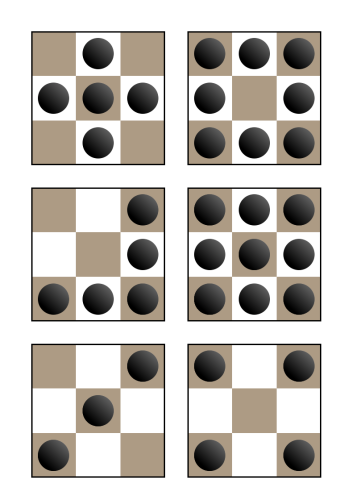 To play chess bowling you need a board similar to a chessboard, but having 81 fields (9×9). A characteristic feature of this board is a borderline around the nine central fields, as you can see on the image below. This central sector of the board has of key strategic importance. 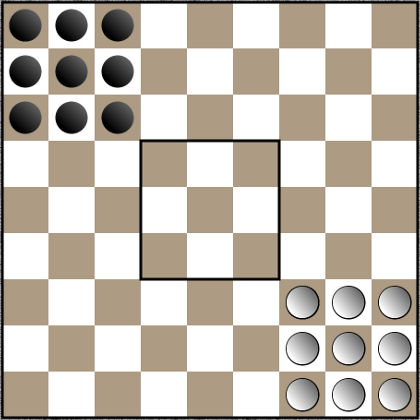 The game is played with 9 white pieces and 9 black pieces. Initial setting: At start stones are set on the board as on the diagram below. Moving Rules: White starts game and then players make moves alternately. 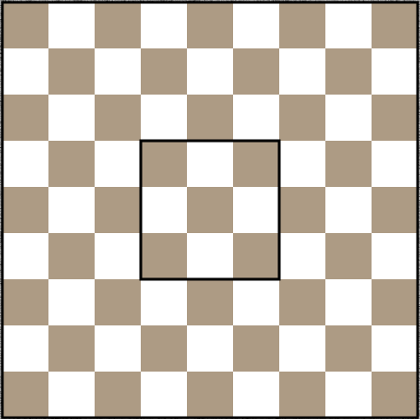 In one move one piece can move to one of the adjacent field diagonally (in other words an adjacent field of the same color). In this game stones never change colors of the fields they stay on. Those on white squares, always stay on white. Those on black squares, always stay on black. Capturing is done by “catching”. I mean stone is captured when it is caught between two enemies along a diagonal line. You can see example of capturing on the diagram below. Black pawn entering the “A” field captures white pawn on the “B” field, because this white stone was captured with the participation of another black stone. Capturing: Stone entering the “A” field captures “B” stone. You can capture more than one stone, as shown in the diagram below. To do this you must “catch” two or more stones on one diagonal line. Capturing two stones in one move. 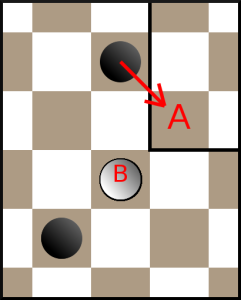 By entering the “A” field a white pawn captures “B” and “C” stones. 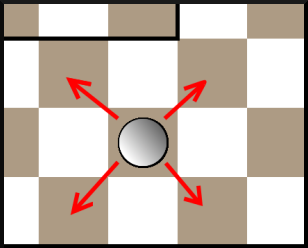 Effect of capturing: As a result of capturing the enemy pawn is not removed from the board. It is transferred to another field of the same color, arbitrarily chosen by player who captures. So stone captured on a white field must remain on a one of white fields. The aim of the game is to achieve certain arrangement of stones in the middle sector of the board. This arrangement should be agreed before start of the game. The diagram below shows examples of winning arrangements. 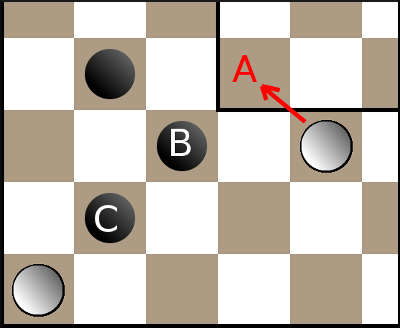 Examples of winning arrangements in chess bowling. I mentioned that chess bowling is a great game. The rules are simple but the challenges are ambitious. I have no idea why this game is so little known. I have no idea why I can’t find books about it. It definitely deserves a better place in the world of board games.